Firefox is a very popular open source web browser. This article provides some tips and information about extensions. Firefox is supported and developed by The Mozilla project, which is a global community of people who believe that openness, innovation, and opportunity are key to the continued health of the Internet. They have worked since 1998 to ensure that the Internet is developed in a way that benefits everyone. 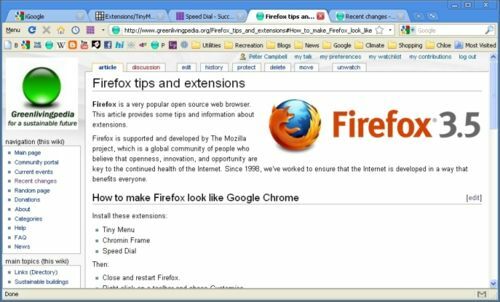 Some extensions can dramatically slow down your browser or make it crash. Sometimes there can be conflicts between extensions that contribute to reduced performance and/or instability. Don't add extensions that you don't need, and remove ones that you are not using. It is worth searching for others experiences with a particular extension too. It is worth upgrading the version of Firefox you use to take advantage of security fixes and performance and other improvements that are available in later versions. However, some extensions will no longer work with the latest version of Firefox and will be automatically disabled after your upgrade is completed. If you rely on these extensions they won't be available until a version is released that will function with the version of Firefox you are using. This could take some time, perhaps a couple of months or longer. In some cases, the author of a particular extension may not provide an updated version. If you wait a couple of months before moving to the latest version of Firefox that will give time for authors of extensions to make a compatible version available. Early upgraders may have to get by without some of their extensions. Note: Previous versions of Firefox have public security problems. You could be exposed to viruses, phishing, and other attacks by running old versions. Firefox 1.x - Late 2004. The original early versions; no longer supported. Not recommended for use. The first major upgrade was Firefox 1.5 in late 2005. Firefox 2.x - Late 2006. Second generation; the last supported version is 2.0.0.20. Introduced tabs. Fairly poor performance. Not recommended for use. Firefox 3.x - Mid 2008. Third generation; current supported version is 3.5.7. Improved performance and stability. Version 4 is still being developed. Right click on a toolbar and chose Customise. Drag all the items on the Navigation tool bar to the Menu toolbar, including the URL box and Google search box. Go to Menu -> View - Toolbars and deselect Navigation Toolbar. Make sure Bookmarks tool bar is selected. Drag all your quick links there, and you can create folders on it with more links in them too. That is it. You still have access to all the Menus via tiny menu. Now you have more screen and less toolbar and menu clutter. Your Firefox browser should now look like this. This page was last modified 00:12, 12 February 2010.